Was that it? Is summer over already? The weather certainly thinks so, and I am already digging out comforting recipes for autumn which is my absolute favourite time of year. Summer produce benefits from getting the ingredients from field to plate as quickly as possible and from as little interference as possible . Autumn is a time for simmering, for blending more robust flavours together. If summer is basil and parsley, autumn is bay and rosemary. If summer is crunch, autumn is slurp. The recipes I want for autumn are ones that refuse to be rushed, that don’t need absolute precision weighing or cooking and that can happily blip away on or in the stove until I am ready for it. With that in mind, there aren't many meals that make me happier than a super slow roast joint of autumn Welsh lamb which has a more intense flavour than spring lamb and revels in heavy spicing and gentle cooking. A large pile of onions braised in the juices underneath serves instead of gravy, making this a versatile recipe for an alternative Sunday roast. Please feel free to go out for a long walk once it is safely in the oven . What I serve this with depends on who I am feeding and what the weather is doing outside. Sometimes I might make some flatbreads, houmous and a couscous salad spiced with harissa. For a casual lunch I often simply serve soft bread rolls and coleslaw. If it is serving as Sunday lunch on a cold, wet day then creamy root vegetable mash or crispy roasted potatoes and veg might be what is needed. Remove from the oven and give a little bit of the lamb a pinch - the meat should be very, very tender and almost disintegrate underneath your fingers. To 'carve', take 2 forks and shred the meat by inserting them into the joint an pulling them apart. As is now traditional for my birthday, my boyfriend went in search of a convenient Michelin starred venue within reasonable distance for a slap up meal. This year he turned up The Stagg Inn, a Michelin Starred pub in Titley, Herefordshire, a mere 2 hour jaunt away (!). We booked in for dinner and to stay overnight in one of the rooms above the pub. All the Michelin starred places I had eaten at before this meal had been fairly formal 'fine dining' affairs, and given that I would rather eat my own arm than get dressed up, this sounded like my kind of place. Once sat at the table we were brought some homemade salted crisps and a super sharp balsamic foam which was a fun start and certainly jolted my palette into life! A quick look at the menu and we had chosen. To start, he had the soup, a delicately spiced curried lentil with onion bhaji. The soup was fine but the bhaji was crisp and light and I would have been very happy with a plate of those and some mango chutney. I had the Cornish crab cake, tapenade, tomato (£8.50) which was very good. The crab cake was crispy without a hint of grease with the very strong crab nicely balanced by the tapenade and sweet tomato. For main, I couldn't resist the classic Fillet of Herefordshire beef , bearnaise, watercress, mustard dressing, chips (£22.90). I ordered the fillet medium and it was a touch overdone for me, however the Bearnaise and chips were absolutely wonderful! Light, crisp and fluffy chips, the sauce rich and buttery it was hard not to lick the bowl clean. He ordered the Sea bass fillet,braised fennel, coriander, dauphinoise potato (£16.90) which came with perfectly crisp skin, creamy potato and a subtle braised fennel that cut through the fish well. To finish he went for the Cinnamon doughnuts with apple puree and milkshake (all desserts at £6.50). The shake was probably the most successful component, the doughnuts were a little heavy although they did have a heady hit of cinnamon. I opted for the Strawberries, Black Pepper Meringue and Cream which was a sort of deconstructed Eton Mess. The meringues were melt-in-the-mouth sugariness but the black pepper was a little lost on me. We enjoyed our visit to The Stagg Inn very much, the menu isn't particularly challenging, being full of classics as opposed to experimental gastronomy but this ties in well with the lack of pretension in the service. They seem to be very well rooted in the local community listing their suppliers on a board in the 'bar' and with a small handful of locals enjoying a pint of real ale. If I had one tiny gripe it is that I was hoping for a bit more 'pub'. In the bar area there was only one table that wasn't laid out for food and I was hoping for somewhere that we could sit and have a beer before (and after!) dinner. As it was, once we had finished eating, we shuffled off back to our room and had a whisky there instead. Such a minor point certainly didn't spoil our evening and if I was in the area again I would be very tempted to call in for a bar meal. La Crêperie de Sophie and its proprietor Loic Moinon will already be very familiar to regular Riverside Market visitors where they whip up deliciously fresh crêpes and and galettes. There is something very satisfying about a humble batter, cooked on a simple hotplate 'en plen air' and transformed into a steaming envelope of cheese and ham loveliness of a Sunday morning! One month ago Loic opened the latest arm to his venture; a charming cafe in the High Street Arcade and since I'm already a fan of their work, I was tempted to go along and try out the broader range of toppings on offer. 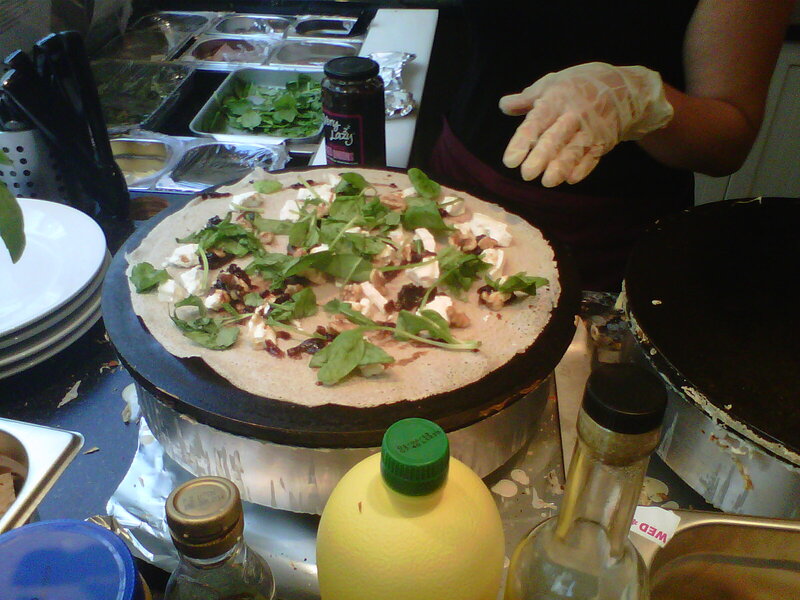 For the uninitiated, crêpes originated in Britanny but are a hugely popular street-food across France. 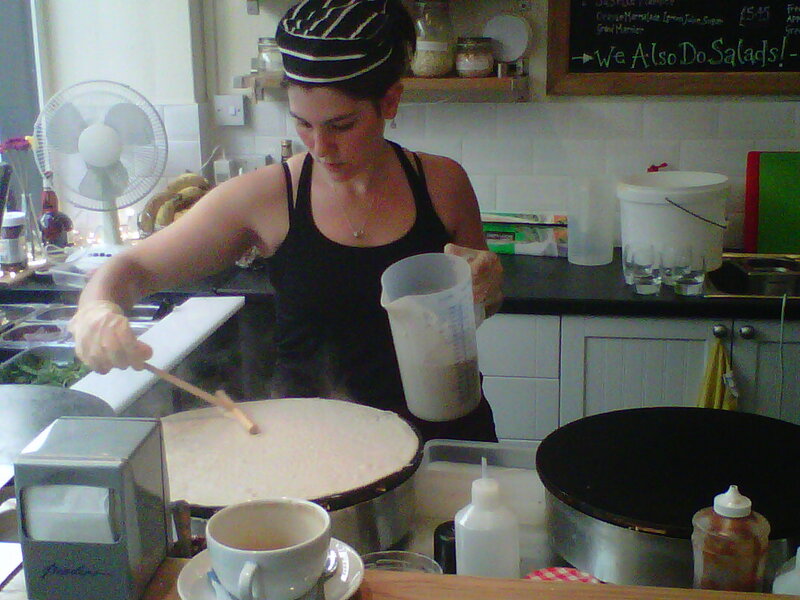 The crêpe is made with a batter similar to our once-a-year Shrove Tuesday pancakes which are most suitable for sweet fillings, or there is the Breton Galette mix, which is better suited for the savoury fillings. My own preference is for the savoury galette and the menu has a good selection of fillings from the classic ham and cheese (£2.95 to takeaway) to gourmet fillings like 'L'Italiene' of parma ham, mozzarella, olives and pesto (£5.45). On asking which was their most popular I was pointed towards the 'Cocorico' - chicken, brie, cranberry, and the 'Sweet Billy' - goats cheese, walnuts, onion chutney, leaves, balsamic, both at £4.45. I'm a sucker for goats cheese, and I'm trying to eat less meat so I went for the Sweet Billy. The galette was very filling (probably too much for me of a standard weekday if I'm honest) which does help to justify the £4.45 price tag. To be fair the quality of the product is high with as much attention paid to the pancake as to the filling. It is also possible to get a ham & egg or sugar & lemon for under £3.00, competitive pricing for an everyday lunch against an M&S sandwich. If you prefer you can also get any of the options as a salad but let's be honest, why on earth would you?!. 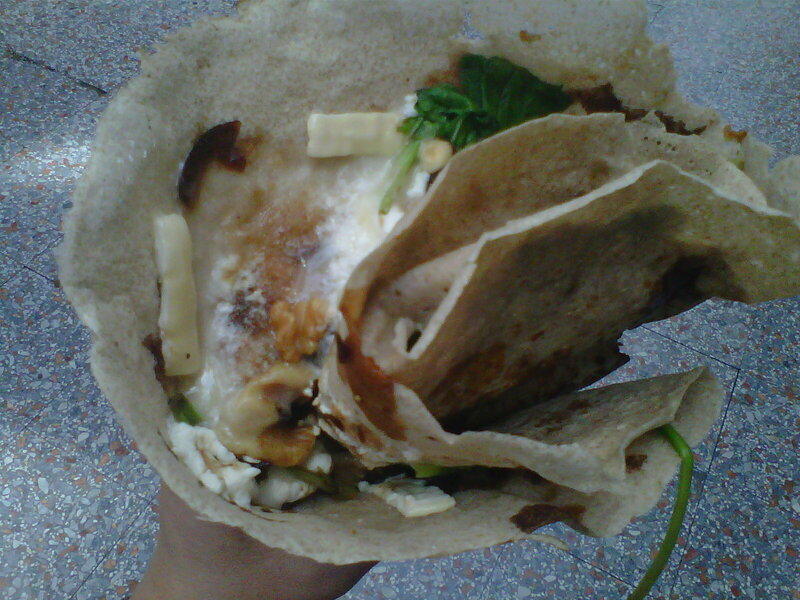 The sweet crêpes looked absolutely amazing, coming in tempting combinations of of fruits, creams, caramels and chocolates. The added bonus of being able to sit 'outside' in the arcade whatever the weather is a draw considering our inclement summer and I'm looking forward to returning soon and working my way through some more of the menu! I was invited along to try out the new menu and as such the lunch was complimentary. 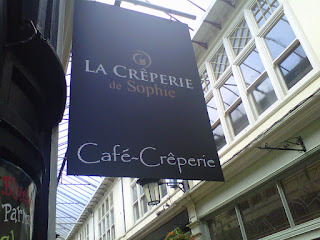 Thanks to Loic and the team at La Crêperie de Sophie. Another weekend, another pre-theatre dinner (it's a old tough life!) but this time the destination was ffresh, the in house restaurant underneath the rather wonderful Wales Millennium Centre. ffresh has been building a good reputation in Cardiff over the last couple of years and, in keeping with the rest of the venue, is pursuing as strategy designed to encourage punters outside the pre-theatre slot with 'guest chef' and themed nights. We have been before as à la carte customers so we were looking forward to a good dinner. When we arrived the Centre was buzzing and the bars were all full so we headed straight in to be seated. We were offered our choice of table and provided with the set menus at £18.50 for 2 courses or £22.50 for 3. To start I ordered the Perl Las soufflé, port and fig jam and rocket salad. The twice baked soufflé was pretty good, but then I am a sucker for a soufflé. The texture was light and fluffy but the flavour was a little muted and I would have liked a stronger hit of blue cheese. I question the presentation of the brown smear of jam and the rocket salad was very tired and limp and a bit brown round the edges. My boyfriend ordered the 'Carmarthen ham and melon salad'. Again this was fine if pretty uninspiring. The ratio of melon to ham was probably a little off but you know what you are getting with ham and melon and this was it. For the main I had the 'Sirloin of Welsh beef, cottage pie, green beans and turnips'. The sirloin, like the salad, was a bit listless and dry, as if it had been sitting around under a heat lamp for just that bit too long. The cottage pie was decent enough, but nothing special and was frustratingly difficult to eat it out of a deep narrow ramekin dish! He ordered the 'Rump of Welsh lamb with rosti dauphinoise, broad beans and peas', sweet lamb with a good gravy was pretty decent but again nothing to shout about. As it was a set menu we decided to go for a dessert but I just didn't fancy any of the 3 options, none of them were screaming decadent to me so I went for the 'Selection of True Taste cheeses'. This was placed in front of me without ceremony and I had to call the waiter back to talk me through what was on it! The plate was made up of Perl Las, Perl Wen, Caerphilly and Y Fenni, some crumbly oat biscuits and a blob of chutney with grapes. All good quality cheese, the Caerphilly in particular was a winner, so no complaints from me. He ordered the 'Summer pudding with Ty Tanglwyst Chantilly cream', a good example of a summer pudding, sharp berries and sweet soft cream (I think he would have preferred custard though!). Overall we were happy with our meal but we have definitely had much better from Ffresh when we have gone as à la carte customers and on a night when there wasn't a show on. My tiny gripe is that none of what we had was cooked 'Ffresh' to order and as a result there were elements that felt a bit 'canteen-y' and this is a crying shame because this restaurant knows what it is doing. I know that for this type of menu there is a trade-off to meet the quick turnaround and the volume of covers but I would have liked to have seen a little more flair and just a bit of actual cooking instead of just plating up. Once upon a time, I made a curry upon which I had lavished love and attention. I ground my own spices, marinated chicken thighs, fried and simmered and then resisted the temptation to dive straight in and allowed it to stand and 'mature' overnight. On my way home I thought about accompaniments. Pilau rice, quality chutneys and bread. Suddenly the thought of my lovely curry being insulted by a long life, mealy, brittle naan was more than I could bear and before I knew what was happening I was Googling recipes for Indian breads and shopping for ingredients. I then set about trying to make a loaf at home, with, it's fair to say, varying degrees of success. The information I found was contradictory (add oil, add sugar, knead gently, slap the dough about etc.) and a lot the recipes were far too advanced. My main problems seemed to be getting good flavour into the dough and getting the loaf to hold it's shape. Early efforts looked more like very deep pan pizzas than loaves. I was frustrated, disheartened, dejected. Then, as if by magic, a fairy-godbaker appeared and invited me, along with Nicky from Cardiff Bites, Mark from Corpulent Capers and Nikki from Your Last Mouthful along to be the guinea pigs in a trial run of The One Mile Bakery, Introduction to Baking Bread course. If you have read this blog before you may have seen my previous series of posts about The One Mile Bakery, a micro business which recently opened, delivering bread, soup and jams in the Canton, Pontcanna and Llandaff areas by journalist Elisabeth Mahoney. It's fair to say that I am a fan of the produce that I've tasted so far so I was curious to see whether I would be able to make bread as successfully myself. As we arrived the Welsh weather was making itself felt and it was pouring down; absolutely perfect for baking. We were greeted with coffee and tea and Elisabeth grilled us about our experience of baking and any issues we wanted to solve. After a discussion about the realities of mass produced bread and the differences between that and homemade bread , it's impact on health and digestion, and the sheer pleasure of the alchemy of baking, our interest was piqued and it was time to get 'hands on'. The course is structured so that you make at least 4 loaves (which you also get to take home with you!). Starting with a simple loaf (you choose your own flours) and working through a flavoured rye bread, towards Elisabeth's favourite, a tasty pain de campagne that incorporates a pre-dough left to rise overnight, the slow ferment giving the loaf bags of flavour. Pay attention to your raw ingredients. Stoneground flours, if you can afford them, produce the best bread, retaining more nutrients and flavour and are still very cost effective. Homemade bread stays fresh for ages and even when stale it can still be toasted or frozen as breadcrumbs for cooking - you don't need the preservatives found in supermarket bread. Don't bother with so-called easy-rise yeast (this is partly where I was going wrong) Dried yeast is really no more work and produces a far superior loaf. Having weighed your ingredients carefully don't use flour to knead, it just messes up your recipe, get yourself a scraper to help handle a sticky dough. The basic processes are dead easy, and once learned, the principles can be applied in lots of ways. Play with ingredients and flavours, adding spices, dried fruits or herbs can turn one recipe into a multitude of variations. Nikki gets to grips with a slippery rye! The course delivered exactly what was promised and since completing it I have been able to successfully make my own loaves at home and I am very proud to say that I haven't bought a loaf from a shop since! If you want to know any more then you'll have to go on the course yourself which I highly recommend you do! For the princely sum of £70 you will learn loads and come away with a skill for life as well as having a really fantastic and fun day. I fully intend going back later this year to complete an Introduction to Sourdough. Or maybe the Italian Breads. Or maybe both! Four happy, floury blogging bakers! We were invited by Elisabeth to try out and feedback on the new course and as such the day was complimentary.